S Pérez-Seijo, M Melle Goyanes, FJ Paniagua Rojano (2018): “Innovation in European public broadcasters: immersive narratives and organization of 360-degree contents on digital platforms”. Revista Latina de Comunicación Social, 73, pp. 1115 to 1136. Introduction. The implementation of immersive narratives in the media has resulted in new forms of production and distribution. The paper presents an analysis of the organization strategies for 360-degree video contents carried out by European public broadcasters through their platforms. Method. It has been carried out an observation and collection of data on immersive narratives in non-fiction contents from webpages and YouTube channels of European PSM, in order to identify strategies for organization and identification of 360º videos and to assess their relevance in dissemination. Quantitative techniques have been used, as well as an analysis sheet to examine a total of 27 websites and 32 YouTube channels. Results and conclusions. The study concludes that the two platforms play a key role as dissemination channels. Also, both of them implement a strategic planning aimed at highlighting these videos, although YouTube leads the way. Immersive journalism; new narratives; European public broadcasters; 360-degree; YouTube. 1. Introduction. 1.1. Mobile communication and new narratives in informative and non-fiction story: alternatives of immersive journalism. 1.1.1. Digital immersive narratives: an innovation formula among PSM. 2. Method. 2.1. Sample. 3. Results. 4. Discussion and conclusions. 5. Acknowledgements. 6. References. The present media ecosystem is characterised by a constant and gradual metamorphosis. National and international media outlets, including Public Service Media (PSM), are a long way from traditional formats. These media apply innovative production techniques for the news, they implement cutting-edge technologies and they experiment with new forms and formats, in an unwavering urge to attract audiences within a market not only saturated of informants, but also of competitors hungry for high profit margins. Differentiation is the new prevailing rule (European Broadcasting Union, 2016). Nevertheless, the search for hallmarks and ground-breaking ways to communicate is not an exclusive pretension of the present century and the network society. Since its very beginnings, journalism has evolved in response to the available methods, techniques and technologies in every age. From the Annals to the Edicts. From the paper to the screen view. From social media information to the virtual reality helmets (VR). Adaptation is thus the word that best defines the story of journalism (Domínguez, 2017). It is therefore a constant search for paths of reinvention, intensified since the end of the last century (Alejandro, 2010). However, albeit journalism has evolved once again in the second decade of the third millennium, this time the evolution has been under the shelter of the network society. Traditional formats hybridize within an ecosystem where everything is (possible). An intangible world which combines the known and the unknown as, unlike previous containers, the Internet powers itself with the daily social feedback to comply with the principle of “adapting or dying”. The leap to the network was the beginning of a scenario where journalism operates today (2017): “the web has changed the world and has revolutionised how information is storage, published, searched and consumed” (Alejandro, 2010: 3). Established the web as the way forward for information flows, and consolidated cybermedia as daily communication organisations, a new challenge emerges: the strengthening of mobile devices as the main Internet-access tools. These devices are at the same time broadcasters, radios, newspapers and computers. Four at a time and, also, portable and ubiquitous. The network and mobile devices paved the way for a dramatic shift in the news landscape. Images gain more power than ever before and a new unprecedented visual culture explodes: “seeing is believing” (Newman & Fletcher, 2017) as the dogma of the new doctrine. Connectivity and the eruption of new consumption models and news production techniques also acquire greater presence thanks to the latest advances in technology and digital structure (Peters, 2016). In this regard, Salaverría (2016) anticipated a news scenario characterised by the emergence of the ubiquitous journalism, favoured by the social significance of mobile devices as tools for producing, disseminating and consuming information; by the progressive expansion of a more robotized journalism, in close connection with recording with drones and automating text using algorithms; and by the development of a more enriched multimedia language. This last trend is precisely one of the main drivers of change in journalism and non-fiction narratives, which also resulted in major alterations in news consumption. In an attempt to enrich a multimedia language that has become routine and common for an increasingly infoxicated audience, 360º video and vr techniques emerge as an option (Baía, 2016; Hardee, 2016) in news’ production. The action, closely linked to the impact of videogames as a growing cultural industry (Domínguez, 2017) and to the gamification of sectors (Longhi, 2016; Kapp, 2012; Domínguez, 2015), has involved a radical change in storytelling. Immersive journalism, named by the American researcher Nonny de la Peña (2010), is established with the aim of bringing the spectator closer to the news - compared with traditional formats-, a goal pursued by the media since their very beginnings (Baía, 2016; Biocca & Levy, 1995; Longhi, 2016: Hardee & McMahan, 2017). “Humans have always told each other stories, and each new era of progress has led to an expansion of storytelling” (Gillmor, 2004). Immersive journalism has encouraged this development due to the hybridisation of sectors and industries. The screen’s barrier between the news and the receiver has come to an end. The audience has now the power to run through that barrier, to break the fourth wall (Murray, 1999; Domínguez, 2013), and to delve into the virtual world to witness firsthand the news’ narrative (De la Peña et al., 2010), thanks to a mediator: vr glasses or helmets. It is, therefore, an experience firsthand of the news through sensory immersion. The arrival and implementation of this trend in media routines not only changes the ways of doing and narrating, but also brings a revolution to the model of consumption. The latter is framed, precisely, within the technological discourse to which the media make the case for: focusing efforts in audiences and relegating efforts to achieve public’s engagement and to make them part of the so-called informed groups to a second place (Peters & Witschge, 2015). The development of new technologies has been essential for progress in new journalism profiles. The user had never been so present in media production. “The implementation of participatory tools in the media arena has created a new concept, participatory journalism, thanks to which citizens provide contents from the information previously produced by the media” (Toural, López & Silva, 2015: 3). “It is interesting that contents are produced by mobile devices, such as cell phones and tables. And it is also interesting that there exists the possibility of a prosumer actor, known in traditional communication models as the receiver, who interacts with content; that is, contents may be produced from concepts and interactivity” (Campaláns, Renó & Gosciola, 2014: 55). Indeed, the role of prosumers is fundamental for the new media arena. Users are not anymore spectators of events, but become new sources and disseminators of information (Cavanilhas, 2010), with the main advantage that the connection is immediate with the place of the event (Espiritusanto & Gonzalo, 2011). In parallel, mobile journalism (MoJo) has emerged, a trend that has gained ground in the media context and in which information professionals are also integrated. At present, journalists may update their media with texts and graphic elements such as videos and images from the scene and using their mobile devices. Users, on their side, may receive and consult information with their devices, anywhere, immediately. “The combination of mobility and the Internet has been successful. We live in a media context that may be called the era of smartphones” (Costa, 2012: 244). In this new phase, characterised by immediacy, information in the palm of your hand and just a click away, the media tend to converge in an only platform from which the user have access to any content and may share their own contents. These new trends also imply changes in consumption models. According to Díaz Noci (2010: 565), “the culture of property –and of the need for information to be printed-, has given way to the culture of access”. In this regard, the author notes that new screens “could be changing the existing consumption patterns of audiovisual contents: from community –cinema– and familiar –television– patterns, to an access similar to the book: individual and in silence” (2010: 565-566). These new trends involve “customising, individualising communication, as each receiver has an only and distinct number, to which preferences and habits of use may be associated” (Costa & Piñeiro quoting Aguado & Martínez, 2010: 663). Mobile journalism thus leads to changes in consumption models and information production. “As a media device, it offers audiovisual content, even the access to broadcasting channels in some cases, and radio stations in others [...] Connected citizens are increasingly mediatised full time [...], answering e-mails, Twitter messages and other apps such as Whatsapp”. (Engel & De Carvalho, 2014: 176). Although the new and revolutionary panorama of convergence has involved a number of obstacles, it is undeniable that the immediacy of new technologies also offers interesting novelties and advantages both for journalists and the audience. Against this prosumer context, mobile communication and immediacy, transmedia journalism emerges. Melle and Pardo (2015) address this trend, following the ideas of the already mentioned Jenkins, as “a situation in which the report is expanded through multiple platforms”, and they add that transmedia is always used thinking of “the best way to exploit their capabilities, each complementing the other in order to offer a complete and rich knowledge of the events and concerns of the real world”. Thus, and despite Jenkins (2003) only talked about fiction narratives, the transmedia’ concept evolved and started to work with possibilities beyond fiction. Transmedia storytelling is now understood as “any structured relation through the media […] beyond narration. We should talk about brands, events, education, activism, journalism/documentary… as logical alternatives of transmedia”. It is also interesting to review the definition of transmedia journalism offered by the guide Mapping the intersection of two cultures: interactive documentary and digital journalism (2014), developed by the MIT Open Documentary Lab. They understand this trend as a story expanded through multiple platforms, each of them used to exploit their potential, and each one complementing the other to offer a complete and rich knowledge of events and concerns of the real world. In short, it is a matter of working with various media platforms using transmedia and crossmedia strategies, of giving very different approaches in order to have a comprehensive overview of facts. In an era of public and offer fragmentation, these approaches offer a way to outline multiple audiences for the same project through their various manifestations, and, at the same time, to meet the needs of diverse audiences in a relatively efficient way. Recovering the definition by Campaláns, Renó and Gosciola (2014: 66), transmedia storytelling is “a language that naturally arises in society, which is gaining more and more ground every day among information producers”. Transmedia narratives give greater emphasis to a new figure of informant: prosumers. Public Service Media are not unaware of this situation, so they are facing the great challenge of the network society, a globalised scenario, an on-demand context, more and more competitors and a communication flow that is increasingly mobile and ubiquitous. Audience is not only in television, the traditional container. Consumption has been also derived to digital platforms, giving rise to a more social ecosystem. Precisely in this context, Public Service Media have been forced to rethink the ways of narrating, producing and disseminating. Under the wing of the latest technological advances, new narratives are put on the table to offer alternatives to organisations before an already wasted multimedia language. To improve it (Salaverría, 2016) and in large part influenced by the boom in the videogame industry, especially vr (Domínguez, 2013), and the gamification of sectors (Longui, 2016; Domínguez, 2015; Kapp, 2012), digital immersive narratives arise. The researcher Nonny de la Peña (2010: 291) named immersive journalism to the production of news using a method that allow people to obtain experiences firsthand of events described in the news’ reports”. The narrative, based mainly on the use of 360º video techniques and 3D synthetic recreation through vr, breaks with existing non-fiction formats. Resources used enable users to immerse in the news’ story and to experience the sensation of presence on the recorded ground and virtual world (Hardee & McMahan, 2017; Baía, 2016; Doyle, Gelman & Gill, 2016; Longhi, 2016). This results in the breakdown of the fourth wall (Murray, 1999; Domínguez, 2013; Longui, 2016) due to the computer screen and mobile devices, which, until the implementation of these immersive techniques in journalism, acted as a separating border between the user and the narrative world of the news’ story. Sensory immersion –physical in such productions with vr- in news’ stories, compared on many occasions to diving (Murray, 1999; Ryan, 2004; Bricken, 1993), is produced thanks to the use of vr googles or glasses, which place the user at the centre of the scene and enable them to discover the scene by moving their head. These tools isolate users from reality itself, the place in which they are physically, and take them virtually to the very place where the events happened (Robson & Costa, 2016), hence, to a second reality. In that line, the present reformulation of the format of the news’ or non-fiction story, has not only affected the form, but has also had consequences in the reception and has given way to a new stage of consumption: far from reading, viewing and listening to the news, users have now the opportunity to immerse themselves in a virtual/digital environment that represent an event of the real world. However, within immersive narratives, one may differentiate two types of formats, linked, precisely, to visual resources of 360º, virtual reality and 3D. The format with an increased presence in the media, due to its low cost and production time, is the 360º video (Hardee & McMahan, 2017; European Broadcasting Union, 2017a), also called cinematic VR (Domínguez, 2017) and motion sphere (Longhi, 2016; Doyle, Gelman & Gill, 2016). These products are based on “a 360-degree rotations of video” (Kool, 2016: 4) where, in consequence, the user shall enjoy the ambient or real sound and could make a rotary motion –although limited, as they are at a fixed location on the stage-, and thus look from top to bottom and from left to right. Many psm have seen the potential of this format, evidenced by the creation of applications designed for the consumption of 360-degrees videos. Some of the platforms available for download are: zdf vr, released in October 2016 by the German Zweites Deutsches Fernsehen; Vive Río: Heorínas, launched for the Rio 2016 Olympic Games by Radiotelevisión Española; and Le Goût du Risque, an app by France Télévisions, the result of a transmedia project of extreme sports, launched at the middle of 2016 in partnership with Radio Télévision Suisse. However, some organisations do not have applications for immersive consumption, and they disseminate contents through other players that support this format, normally embedded in their main websites (European Broadcasting Union, 2017a), and digital platforms such as YouTube and Facebook (European Broadcasting Union, 2017a, 2017b). The latter two enable the reproduction of 360º videos with no problem (Robson & Costa, 2016) and, at present, especially YouTube, act as relevant repositories of storage, diffusion and consultation of immersive videos (Pérez-Seijo & López-García, 2017). “This immersive experience opens all sorts of possibilities for content producers, allowing them to move away from linear TV storytelling to one where the audience can gain greater context by visually exploring that which is typically out of view. Moreover, VR content is now supported via YouTube and Facebook, amongst others”. (Public Service Media, 2017). There are two paths when consuming these pieces: using vr glasses and through the screen of mobile devices -either through tactile interaction or using the gyroscope-, which becomes an access window to the virtual world (Hardee & McMahan, 2017). The second format would be that of products synthetically generated by computer in 3D. vr pieces and cg-content are based on the construction of spherical scenes –360º display is enabled-, imaginary or real (Owen, Pitt, Aronson-Rath & Milward, 2015), through three-dimensional and synthetic images (Robson & Costa 2016). Also, these pieces may be enriched with real audio testimonials, in order to give more credibility to the recreated scene. The user access to these virtual worlds thanks to the use of vr glasses and as an avatar –usually-, an animated representation which acts as their being in the news’ scenario (De la Peña et al., 2010). As the digital alter ego serves as the body of the receiver, it is common that the participant can only see their extremities –legs and arms-, in order to give realism to the immersion process. It would be, therefore, a strategy of primary internal ocularization. While both typologies of immersive products are very different as regards production, 360º videos and cg-content offer, to a greater or lesser extent, resources to increase the feeling of exploration of news’ scenarios (Domínguez, 2017). The so-called immersive trend, especially vr, is articulated around three elements that, combined, allow reaching the narrative immersion (De la Peña et al., 2010): the illusion of presence that may be produced when the user is moved to a virtual scenario although they know they are not there physically; plausibility, that is, the feeling that something or a certain situation is real, even though what they are watching is a recording or a three-dimensional synthetic recreation; and, to complete the triad, the possession of a synthetic body in the virtual world or, in other words, an avatar to access the scene. In this last case, when the immersive piece is a 360º video, users do not access as avatars -as an animation would undermine credibility to the recorded action-; it is used a subjective camera. The cinematographic resource consists of simulating that the figures of the audiovisual piece talk to, look at and address to the user, pretending that the user is actually on the filmed scene (Domínguez, 2017). Obsolescence is one of the main challenges facing Public Service Media. Winning the battle is a matter of resources, willingness/initiative and changes in the ways of communicating and spreading the news. Innovation, in a nutshell. To promote and develop the concept of public service media, and their values, in particular, of universality, independence, excellence, diversity, accountability and innovation. To safeguard and improve freedom of expression and information, which is one of the essential foundations of a democratic and progressive society. To enhance freedom and pluralism of the media. To employ and develop information and communication technology as a means to further the right to access to these media. To develop cultural diversity in order to promote tolerance and solidarity. To protect and promote Europe’s cultural heritage and the development of its audiovisual creation by offering an increasing choice of programmes and services. To reinforce the identity of the peoples, social cohesion and the integration of all individuals, groups and communities. To fulfull the public’s expectations in the information, educational, cultural and entertainment fields through the production and dissemination of a diversified range of high-quality programmes. “We strive to be a driving force of innovation and creativity. Dirigimos nuestra vista a nuevos formatos, tecnologías y formas de conectar con nuestra audiencia. We want to attract, retain and train our staff so that they can participate in and shape the digital future, serving our public”. (European Broadcasting Union, 2012). The team of Technology & Innovation is involved in guaranteeing that these issues are adequately addressed. The ebu created this department in order to investigate, develop and implement the latest techniques, technologies and broadcasting media: “our Technology & Innovation team is here to accelerate technology innovation and deliver superior expertise, quality and commitment to Members” (European Broadcasting Union, 2015a). Steps taken until 2017 are: the move to digital radio, the investment in high-definition television (hdtv), and the implementation of immersive narratives of virtual reality–vr– and 360º. These tasks for advance and digital and technological development, though, are not limited to a reduced group of experts of the ebu, but to all the members of the organisation. Members can be up-to-date with latest news on formats, media and ways of consuming, since the ebu regularly organises workshops, participates in international conferences, such as Innovation Broadcast Conference (ibc), creates discussion platforms for members, and suggests networking and knowledge events (European Broadcasting Union, 2017b). “This year we focused on the spectrum debate, digital radio, integrated media production, networked production, net neutrality, hybrid television and the next generation of immersive user experience in television and sound”. (European Broadcasting Union, 2015a: 4). Referring to 360º products and vr as “the next generation of experience”, the department of Technology & Innovation made already clear the changes in consumption models facing users in the near future. A challenge accelerated by the growing commitment of the game industry to the vr and sensorial immersion through vr helmets and glasses. A year after, in the report published in 2016, coinciding with the advance and the progressive impact of immersive techniques and technologies in the production routines of national and international media, the ebu’s technological department decided to include a section of “360 degree cameras and virtual reality” in the production highlights. The main alliance of Public Service Media showed this way its interest in immersive narratives and its commitment to encourage the application of these techniques among its members. “The ebu is currently investigating this new technology and the ways it can be used for creating new, personalized content for audiences in the future. We had more than 10 demonstrations of virtual reality from ebu Members and manufacturers at this year’s Production Technology Seimanr and we are currently providing technical support to extend the current ebu News Exchange Platform to support this new technology”. (European Broadcasting Union, 2016a: 9). In 2016, the ebu also launched the report Vision 2020: Connect, Grow and Influence. The document presented the strategic goals for the next four-year period. Among them, it was the production of virtual reality/immersive content (European Broadcasting Union, 2016b: 15) as a potential way to reconnect with audiences (2017b). Since then, efforts by ebu members have focused on video production using 360º video techniques, the most extended format (Hardee & McMahan, 2017; European Broadcasting Union, 2017a): more than half of members have started, or are in process, to facilitate access to 360º contents (European Broadcasting Union 2017b: 8), while most of them are experimenting and offering users novice products focused on testing and receiving feedback. Nevertheless, the reasons-why of the momentum of 360º videos, also known as cinematic vr (Domínguez, 2017) and spherical pieces in movement (Longui, 2016; Doyle, Gelman & Gill, 2016), are mainly their lower total cost and their possibilities of immediacy when compared with contents generated synthetically with computer with vr, as well as the democratisation of their access among consumers thanks to the proliferation in the market of low cost virtual reality glasses (Hardee & McMahan, 2017). Google Cardboard is the most paradigmatic example in this regard. In 2017, one of the most relevant actions related with immersive narratives, was the co-foundation of the vr Industry Forum (vrif). The paper comes into being with the aim of assessing how psm organize and categorize/identify their immersive contents in video 360º –both information and non-fiction– in two of the main platforms to access audiovisual products: websites and YouTube. We start from the hypothesis that these entities try to follow a strategy focused on providing access to receivers in order to obtain nonresidual consumption figures. The reasons for this desire may be found in the short age of immersive narratives applied to digital journalism and the ignorance by a large part of the public of both the format and the consumption process. The relevance of immersive journalism and its study is important given that the narratives of which it is composed are in increasing expansion and gradual –although still new– consolidation in the media. Regardless of whether European psm focus their efforts on identifying immersive contents, we also aimed to find out how these contents are organised, ranked and categorized, and, therefore, which strategies and methods are applied to their websites and YouTube accounts. The sample for the study is the group of the PSM EU-28, simultaneously members of the ebu, that implement immersive techniques and narratives of 360-degree video in their news’ and non-fiction contents. The sample corresponds to one set out in a previous study (Pérez-Seijo & López-García, 2017), and which is formed by those organisations that have applied immersive techniques at least once in the last 18 months between October 1, 2015 and March 31, 2017. It is important to include those organisations belonging to the ebu, as one of the goals of the organisation is the constant innovation, the enrichment of the panorama of public service media and the democratisation of access for society to the latest technological advances in ways and consumptions. This way, the Public Service Media analysed are the 33 shown in the table. It should be noted that we only mention the acronyms in the results, which are also included in Table 1. When extracting the sample of platforms –webs and YouTube channels– with published immersive content, we proceed to a direct search and subsequent coding in lists by organisation. We started the collection on April 1, 2017, and ended on April 15 of the same year. The next 15 days were devoted to the identification of lists, so they correspond to all those available on April 2017. We assessed 27 websites, YouTube channels linked to 32 organisations and 30 lists found in YouTube accounts. The names of these elements, cited in the results, have not been translated nor altered, so style and typographical syntax are kept. The results are based on quantitative methods. We have designed an analysis sheet to speed up data collection processes. Dissemination of non-fiction content in 360º video on the web. The web has a section devoted to contents in 360º video. Use of subheadings and dividers to highlight contents in 360º video. Dissemination of content in 360º video on a main or linked YouTube channel. Exclusive channel for immersive contents. What lists and in which channels? The paper pretends to understand how psm organize their non-fiction and news contents in 360º video on two of the main digital platforms for disseminating audiovisual products: their official websites and their YouTube channels, all those linked to the organisation and their programs. In the case of websites, we take a look at how broadcasters identify and highlight these pieces in the news and pages, as well as whether they create or not specific sections to storage immersive contents. These strategies would aim at making these products more visible and facilitating users the access and consumption. As regards YouTube, we focus on noticing how many entities have created exclusive channels to disseminate immersive contents, and how many of them used the existing ones linked to the organisation and their programs. In the latter case, we also pay special attention to the categorization and identification of 360º videos through lists. As it happens with websites, the strategy not only speeds up the user’s searching and identification process, but also the enjoyment. Broadcasters’ websites are relevant repositories of audiovisual information and content. Websites enable access to a large part of products broadcasted, a task facilitated by the creation of sections. The research aimed at assessing whether immersive contents were also organised and whether, therefore, were identified as a common section in order to make it easy for users the access and consumption. The first step consisted on assessing how many psm publish immersive contents on their websites. The result was that 81.82% use their website to disseminate 360º videos: dw, ndr, br, wdr, mdr, hr and rbb from ard (Germany); rtve (Spain); vara, vpro, eo, avrotros, kro-ncrv, nosand Omroep max from npo (Netherlands); ftv (France); yle (Finland); rai(Italy); rtbf (Belgium); mtva(Hungary); rte (Ireland); bbc (UK); lrt (Lithuania); zdf (Germany); vrt (Belgium); orf (Austria); and dr (Denmark). After tracking these platforms, only 29.63% of broadcasters have created a specific section for storing 360º videos and facilitating their access. On the contrary, 70.37% of Public Service Media had not yet created, on April 2017, what we have called immersive videos on-demand. Table 3. Sections for 360º videos on PSM’ websites. So far, just eight broadcasters have created sections devoted to 360º contents on their websites. They work as repositories where 360-degree videos are stored, which make it easier for the user to access and consume those pieces. Broadcasters with section for 360º contents are: eo, from the German organisation npo, with “eo Virtual reality”; the British bbc with two section inside the lab Taster, “Immersive stories” and “virtual reality”; wdr, from the German ard, with “360º videos”; ndr, also member of the ard, with “ndr 360º –alle videos mint rudumblick”; zdf, also German, with “360º staunen”; the Belgian vrt with “360º-video”; rtbf, also Belgian, with “vr et 360”; and, finally, the Spanish rtve with “vr” inside the page of rtvelab. However, although the remaining 70.37% of broadcasters disseminating immersive contents on their websites do not have specific sections, it does not imply a lack of differentiation. Among the most common alternatives, one can find subheadings to identify a 360º information or page, and the creation of subsections with these contents inside special reports. The coverage of the 2016’s Olympic Games by the Italian rai is a clear example. The section Sport prepared a special report in which included the subsection “Rio vr 360”, where the organisation concentrated all their 360º videos on sports competitions. YouTube is one of the most appealed digital platforms by psm when disseminating non-fiction and news’ contents in 360-degrees. Figures confirm this: 96.97% of corporations have used YouTube to upload these videos: rtp (Portugal); rtve (Spain); rte (Ireland); bbc (UK); rai (Italy); ftv (France); rtbf (Belgium); vrt (Belgium); dr (Denmark); zdf (Germany); ur (Sweden); yle (Finland); lrt (Lithuania); tvr (Romania); mtva (Hungary); orf (Austria); swr, br, mdr, dw, hr, ndr, rbb and wdr from ard (Gemany); and bnn, vara, vpro, eo, avrotros, kro-ncrv, nos and Omroep max from npo (Netherlands). As with websites, our goal here is to assess how broadcasters organize immersive products on YouTube. That is, whether they choose to centralize contents and maintain an order, or whether disorder and free will prevail. We raised the question of whether broadcasters are committed to create YouTube channels exclusively devoted to 360º contents or whether they make use of the existing linked to the organisation and their programs. In this regard, 96.87% of psm has not created a specific YouTube channel for their 360º contents. Thus, just 3.13% of corporations have created a channel dedicated solely and exclusively to their non-fiction and news 360-degree productions. The Belgian vrt is therefore the only broadcaster that decided to differentiate their contents in 360º videos, as it created a specific channel: vrt Virtual Reality. However, although vrt created it as a kind of centralization of its immersive products, the strategy was changed and these pieces are now disseminated in other channels. Given these results, another question arises: if broadcasters do not create specific channels for motion spheres, would they create YouTube playlists? Our approach tried to assess whether corporations tried to identify their immersive contents and, therefore, facilitate access to them by classifying pieces in lists. To do so, we assessed all the YouTube channels belonging to each corporation –official, programs, thematic, etcetera–. Data obtained showed a dichotomous outcome, as there is a slight difference between those with playlists and without them. 53.13% of broadcasters with 360º contents in YouTube have created one or more lists in their channel/s, while 46.87% do not choose this distinction. 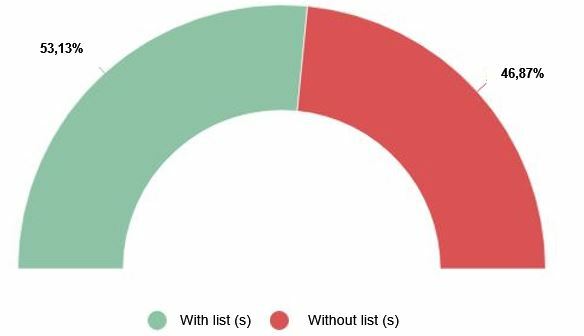 Among broadcasters that do not sort contents by lists are: orf (Austria), rtp (Portugal), lrt (Lithuania), dr (Denmark), rte (Ireland), yle (Finland); rai (Italy); bnn, vpro, avrotros, Omroep max and eo from npo (Netherlands); and dw, hr and rbb from ard (Germany). On the contrary, those that have created playlists that not only group contents, but also identify them and facilitate their access and consumption, are: rtve (Spain), ur (Sweden), rtbf(Belgium), vrt (Belgium), mtva (Hungary), ftv (France), bbc (UK), zdf (Germany); tvr (Romania); mdr, br, ndr, wdr and swr from ard (Germany); and vara, kro-ncrv y nos from npo (Netherlands). While the number of psm with a YouTube playlist is 17, the lists found are 30. That allow us to conclude that some organisation have more than one playlist to differentiate their contents. Within the 53.13% of European public broadcasters with lists to identify their contents, 64.71% of the total only has one, while 35.29% has created two or more. That 64,.71% of organisations that identify their 360º contents YouTube with an only list, are: rtve (Spain), with “Vídeos 360º” on its channel rtve .es; rtbf (Belgium), with “vr et 360” in rtbf; vrt (Belgium) with “360/vr” on its channel vrt nws, devoted to current news; ur (Sweden), whose list is called “Mobbning i 360” –devoted to a bullying report–, which is on the channel ur; br, from ard, with “360-Grad-Videos”, which is on the channel Bayerischer Rundfunk; ndr, from the German ard, with “Dokus in 360º” on the channel ndr Doku, devoted to documentaries; SWR, from the German ARD, with “360 Grad Views” on swr; mtva (Hungría) with “A Dal 2017 - Multicam 360° videók”, devoted to a contest for the Eurovision representative, which is on its channel A Dal 2017; tvr (Romania) with “Clipuri filmate cu tehnologie 360°: Imagini de la Eurovision”, on the channel tvr; vara, from the Dutch group npo, with “dwdd Pop Up Museum 2: 360° Tour”, on the channel dwdd, from the program De Wereld Draait Door; and, finally, nos, from the Dutch group npo, with the list “Rondkijken in 360 graden”, on the channel nos Sport. “360 Grad-Videos von mdr thüringen”, inside the official channel: mdr Mitteldeutscher Rundfunkm. kro-ncrv, from the Dutch organisation npo. It has three lists, all inside the channel of the program Brandpunt, which receive the same name. Apart from the use or non-use of YouTube playlists to organize and identify immersive contents, we also wonder about the existence or not of a trend towards concentration of 360º videos on an only official channel or if, on the other hand, these contents are scattered in various accounts. Data obtained are close in figures. In this regard, 56.25% of European PSM that have disseminated or disseminate 360º contents on YouTube do it through an official channel. It is therefore a strategy of content concentration, which facilitates users the consumption of contents and access to them. The organisations with this strategy are: rtve (Spain) from rtve.es; rtbf (Belgium) from rtbf; Ndr, from ard (Germany), from ndr Doku; swr, from ard (Germany), from swr; dw, from ard (Germany), dw Deutsch; hr, from ard (Germany), hessischerrun dfun; rbb, de ard (Germany), from rbb; mtva (Hungary) desde A Dal; tvr (Romania) from tvr; kro-ncrv, from the group npo (Netherlands), from Brandpunt; bnn, and npo (Netherlands), Omroep bnn; vpro, de npo (Netherlands), from Vpro.nl; avrotos, from npo (Netherlands), from avrotros; Omroep max, from npo (Netherlands), Omroep Max; rtp (Portugal) desde rtp; lrt (Lithuania) from Lietuvos nacionalinis radijas ir televizja; raI (Italy) from Rai; and ur (Sweden) from ur. On the other side, the remaining 43.75% do not concentrate contents in an only channel and opt for the dissemination of production through different channels, which are usually linked to the thematic or belonging to a certain TV program.Corporations included in this figure are: vrt (Belgium); br, from ard (Germany); mdr, from ard (Germany); wdr, from ard (Germany); zdf (Germany); ftv (France); dr, from the npo (Netherlands); vara, from npo (Netherlands); nos, de npo (Netherlands); eo, from npo (Netherlands); bbc (UK); orf (Austria); yle (Finland); and rte (Ireland). Immersive narratives represent a challenge for the public audiovisual arena, which are framed precisely within PSM’s commitment to renew itself, to innovate and to be, following the mission of public service, referent for society. In this regard, the EBU has played a key role in promoting the implementation of 360º recording techniques and the production of synthetic contents with VR among its members. It was a task carried out by departments such as Technology & Information. In this sense, by March 2017 (included), 33 Public Service Media in Europe, already included 360º videos in their offer. Nevertheless, the research focused on the use of two digital platforms: the PSM’s official websites and their YouTube channels. Once the study is completed, it is confirmed the substantial relevance of both platforms as tools for publishing, disseminating and storing spherical videos. Leading the use is YouTube, with an overwhelming majority, while web pages follow it closely. Both platforms allow us to perceive how some PSM try to implement management and visibility strategies for immersive contents. As far as websites, two trends may be identified: on the one hand, those which create sections of generalist contents in spherical-video format that become immersive video-libraries; on the other hand, those who separate 360º videos and use other strategies such as subheadings to identify and highlight in information and even the creation of subsections devoted to these contents in special multimedia coverages. However, there is a greater planning effort in PSM’s YouTube channels. Public Service Media show a clear tendency to use their official channels to publish their spherical pieces. Although this may lead to thinking that dispersion may reign on the platform, a bottom-up strategy may be observed. The use of already created channels including non-spherical videos leads to two possibilities: first, that PSM take advantage of the channel’s visibility and the public’s understanding to disseminate a novel video format; second, that they try to capture the attention of an audience they already have and, thus, they ensure a consumption that, although it could be reduced, would avoid residual consumption figures in spherical pieces. However, there is a lack of general consensus when it comes to avoiding content decentralization. A timid majority disseminate through a single channel, in an effort to concentrate all their immersive content, but the rest tend to publish in various accounts, depending on the topic, the event and the program. Despite this situation, which in many cases results in a stony road, an interesting trend is detected in the platform itself. More than a half of broadcasters have created one or various playlists devoted to 360º videos. The decision is strategic for several reasons: they serve to identify and separate spherical from non-spherical videos; they give them greater visibility; and, as a result, favours and facilitates access and subsequent consumption. Also, all the organisations with playlists in YouTube show a common pattern: they present a generalist list, which acts as a repository or videolibrary, and another one with different topics, devoted to contents that, for some reason, they want to stand out above the rest. Nevertheless, while the strategic approach in YouTube is more evident than in websites, both of them try to facilitate access, and, as a direct consequence, consumption of 360º videos. These are strategies set out before the short age of immersive narratives in the media arena and the ignorance of the format and consumption of such contents by a large proportion of the public. Finally, while the ebu values the application of techniques, resources, narratives of immersive journalism as a potential strategy to connect with audiences, the uncertainty of its success, management and real utility –the latter understood as the added value of the product as regards content and experience-, are put on the table as the most urgent handicaps. J Alejandro (2010): Journalism in the age of social media. Oxford: Reuters Institute for the Study of Journalism. A Baía (2016): “Mundos virtuais e jornalismo imersivo: uma resenha histórica e conceptual”. Estudos de jornalismo, 6(1), pp.100-112. F Biocca & MR Levy (1995): “Communication applications of virtual reality”, en VV AA, Communication in the age of virtual reality (Eds., F Biocca & MR Levy). Hillsdale: Laurence Erlbaum Associates. M Bricken (1993): “Mundos virtuales: sin interfase para el diseño”, en VV AA, Ciberespacio. Los primeros pasos (Ed., M Benedikt). México: Consejo Nacional de Ciencia y Tecnología, Equipo Sirius Mexicana. C Campaláns, D Renó & V Gosciola (2014): Narrativas Transmedia: entre teorías y prácticas. Barcelona: Oberta UOC Publishing. C Costa Sánchez & M Piñeiro Otero (2010): “Prensa en la cuarta pantalla. Movilidad de la información del papel al bolsillo”. El Profesional de la Informacion, 19(6), pp. 632-636. C Costa (2012): “Ciberperiodismo en el smartphone. Estudio de la multimedialidad, usabilidad, hipertextualidad e interactividad de las aplicaciones de medios nativos digitales para smartphone”. Estudios sobre el Mensaje Periodístico, 18(0). N de la Peña, P Weil, J Llobera, E Giannopoulos, A Pomés, B Spaniang, D Friedman, M Sánchez-Vives & M Slater (2010): “Immersive Journalism: immersive virtual reality for the first-person experience of news”. Presence: Teleoperators and virtual enviroments, 19(4), pp. 291-301. J Díaz Noci (2010): “Medios de comunicación en internet: algunas tendencias”. El Profesional De La Información, 19(6), pp. 561-567. E Domínguez (2013): Periodismo inmersivo: La influencia de la realidad virtual y del videojuego en los contenidos informativos. Barcelona: Editorial UOC. E Domínguez (2015): “Periodismo inmersivo o cómo la realidad virtual y el videojuego influyen en la interfaz e interactividad del relato de actualidad”. El Profesional de la Información, 24(4), pp.413-423. E Domínguez (2017): “Going beyond the classic news narrative convention: the background to and challenges of immersion in journalism”. Frontiers in digital humanities, 4:10. M Engel & J De Carvalho (2014): Jornalismo e Convergência. São Paulo: Cultura Académica Editora. NO Espiritusanto & P Gonzalo (2011): Periodismo ciudadano. Madrid: Fundación Telefónica. European Broadcasting Union (2012): Empowering society: a declaration on the core values of public service media. Ginebra: Technology and Innovation. European Broadcasting Union (2015a): Activity report 2014-2015. Ginebra: Technology and Innovation. European Broadcasting Union (2015b): Statutes of the European Broadcasting Union. Ginebra: Technology and Innovation. European Broadcasting Union (2016a): Activity report 2015-2016. Ginebra: Technology and Innovation. European Broadcasting Union (2016b). Vision 2020: connection, grow and influence. Ginebra: Technology and Innovation. European Broadcasting Union (2017a): Opportunities and challenges for public service media in vr, ar and mr. Ginebra: Technology and Innovation. European Broadcasting Union (2017b): Virtual reality: How are public broadcasters using it? Ginebra: Technology and Innovation. D Gillmor (2004): We the media: Grassroots journalism by the people, for the people. Sebastopol: O'Reilly. GM Hardee (2016): “Immersive Journalism in vr: Four Theoretical Domains for Researching a Narrative Design Framework”, en VV AA, Virtual, Augmented and Mixed Reality (Eds., S Lackey & R Shumaker). vamr 2016. Lecture Notes in Computer Science, 9740. Springer, Cham. GM Hardee & R McMahan (2017): “fiji: a framework for the immersion-journalism intersection”. Frontiers in ict, 4:21. H Kool (2016): “The etichs of immersive journalism: a rethorical analysis of news storytelling with virtual reality technology”. Intersect, vol. 9(3), pp.1-11. R Longui (2016): “Narrativas imersivas no webjornalismo. Entre interfaces e realidad virtual”.XIV Encontro Nacional de Pesquisadores em Jornalismo. Palhoça-Unisul, Brasil. M Melle & A Pardo. (2016): Las Narrativas Transmedia en Harry Potter. Trabajo de fin de grado: Universidade de Santiago de Compostela. JH Murray (1999): Hamlet en la holocubierta: El futuro de la narrativa en el ciberespacio. Barcelona: Paidós. S Pérez-Seijo & X López-García (2016): Xornalismo inmersivo e televisión públicas europeas: plataformas, aplicacións e posibilidades de consumo. Universidade de Santiago de Compostela: Actas I Congreso Internacional AGACOM Alén das fronteiras: redes na diversidade. C Peters & T Witschge (2015): “From grand narratives and democracy to small expectations of participation: audiences, citizenship, and interactive tools in digital journalism”. Journalism Practice, 9(1), pp.19-34. C Peters (2016): “Spaces and places of news consumption”, en VV AA, The sage Handbook of digital journalism (Eds., T Witschge, CW Anderson, D Domingo & A Hermida). Londres: sage Publications. W Robson & L Costa (2016): “Jornalismo imersivo: perspectivas para os novos formatos”. Leituras do jornalismo, 6, pp.99-116. ML Ryan (2004): La narración como realidad virtual: La inmersión y la interactividad en la literatura y en los medios electrónicos. Barcelona: Paidós. R Salaverría (2016): “Los medios de comunicación que vienen”, en VV AA, Innovación y desarrollo de los cibermedios en España (Eds., C Sádaba, MD Martínez-Costa & GA Alberto). Pamplona: eunsa. A Toffler (1996): La tercera ola. Barcenola: Plaza & Janés. C Toural, X López & A Silva (2015): “O xornalismo participativo cobra forza en España da man dos dispositivos móbiles” Actas XIV Congreso Internacional IBERCOM 2015, São Paulo, IberCom. S Pérez-Seijo, M Melle Goyanes, F J Paniagua Rojano (2018): “Innovation in European public broadcasters: immersive narratives and organization of 360-degree contents on digital platforms”. Revista Latina de Comunicación Social, 73, pp. 1115 to 1136.